Tax incremental financing might seem to be a dry and technical subject. The details are real green-eyeshade stuff. But their impact on the political process teaches us a tantalizing lesson: Tax incremental financing is an occasion of sin. There are two problems — one related to the obscure and difficult to understand nature of tax incremental districts (TIDs) and the other related to the simple way in which politicians can sell them. In other words, what we can’t see is critical and what we do see can be misleading. Let’s start with the fuzzy stuff. The idea behind tax incremental financing (TIF) is that a subsidy to a developer is necessary to cause the development to happen. Because the subsidy is “paid for” from the taxes levied on new development that would not otherwise occur, the creation of a TID is supposedly a win-win. But determining whether the conditions for the creation of a TID and whether the subsidized development would not otherwise occur is a complicated inquiry. 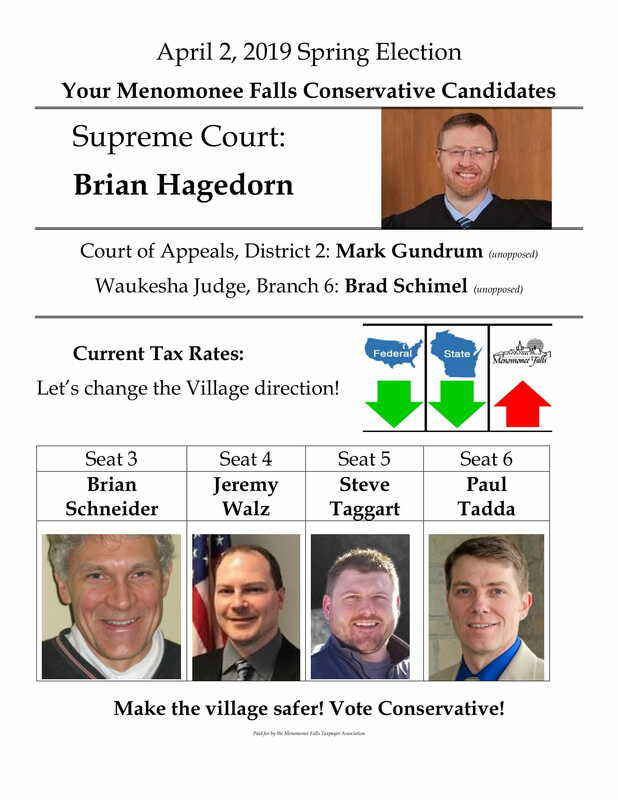 Here in Wisconsin we need nomination signatures to get our people on the ballot each year (yes, even the incumbents!) Help a Conservative! Sign Nomination Papers and send them in! Signatures count from April 15th thru June 1st. Get Governor Scott Walker on the Ballot! Get Lt. Governor Rebecca Kleefisch on the Ballot! Get Sec State Candidate Jay Schroeder on the Ballot! Get Congressman Sensenbrenner on the Ballot! Get Assembly Rep. Brandtjen on the Ballot! Get Senate Candidate Leah Vukmir on the Ballot! Get Senate Candidate Kevin Nicholson on the Ballot! But it’s what Trustee David Glasgow said just before the vote that caught some of his colleagues off guard. “We’ve been getting regular status updates from Mark Fitzgerald about the delays and worker shortages,” Glasgow said in comments addressed to the developer during the meeting. His fellow trustee, Katie Kress, said she does not recall any updates given to the board about project delays. Walz also says no updates were given to the board. But in an interview with FOX6 Investigators, Glasgow doubled down on that claim. “All seven of us have known for quite some time – we’re talking 6,7,8 months – of the delays involving the developer and what they were experiencing,” he said. “Were you getting emails? Were you getting memos? How were you getting these updates?” asked FOX6 Investigator Bryan Polcyn. What meetings? Glasgow said it was discussed in at least one closed session in January and possibly open sessions of the Community Development Authority. However, a FOX6 Investigators review of Menomonee Falls Village Board records shows the Riverwalk on the Falls project hasn’t appeared as a discussion item on any meeting agenda since 2016 — open or closed. And Glasgow never did specify a particular meeting in which the delays were discussed. Did Dave Glasgow compare Romney voters to Nazi soldiers? For the last few days we’ve been getting calls from people referring to Dave Glasgow as “Crazy Dave”. They said he had some very disturbing views and was extremely intolerant of people who vote differently than he does. We pushed for the proof and got it. During the 2012 election cycle Crazy Dave likened Romney voters to Nazis!! Here it is. I throw in my vote for one evil man or the other to “rule” over the lives of millions who will suffer under such “rule”, and thus I bear a certain responsibility. There’s no way of getting around that. Do we see no inherent conflict with preaching Christ, while bearing the fruit of supporting, condoning, even bringing into prominence evil, or evil people? I don’t see how we can use the reasoning “well, it wasn’t my fault”, any more than Nazi soldiers can say “it wasn’t my fault, I was just following orders”. And I don’t see how we can preach standing for holiness and righteousness on the one hand, condemning ungodly rulers elsewhere, then vote for an ungodly ruler for our own country, under the pretext that he isn’t “as bad” as the other guy. Once we go down that “lesser evil is better than worse evil” road of compromise, we have opened the door to all manner of “lesser evil” and as a result have lost the principle of purity and holiness. I am not against voting in general. But I cannot reconcile preaching truth and righteousness on one hand, while on the other hand helping to place in power over the culture (and in reality, that’s exactly what voting for a ruler does), a man and his administration which is, or signs into law, what is contrary to that same truth and righteousness. How many board meetings did Dave Glasgow miss in one year? Dave Glasgow has missed 5 board meetings in the span from October of 2016 through September of 2017. Interestingly, Dave Glasgow has not served a full term on the Village Board.